Bieber, Justin — The tween heartthrob has announced that he will be awarding roles in his upcoming 3-D movie to fans who upload videos of themselves to his personal fansite. So far, the film stars Bieber himself, that female reporter who falls while stomping grapes, the Chocolate Rain guy, the kid who just wants us to leave Britney alone and fourteen people getting hit in the crotch. "That's not tax evasion...THAT'S tax evasion." 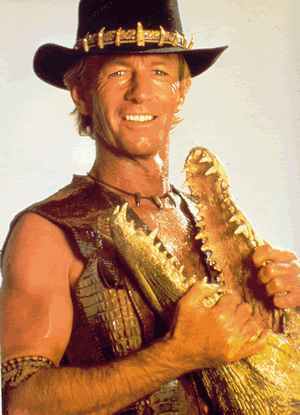 Hogan, Paul — Australian officials are currently preventing Crocodile Dundee actor Paul Hogan under accusations that he owes upwards of $12 million in unpaid back taxes. Aussie government has already confiscated the entirety of Hogan’s assets made from the films Almost an Angel and Lightning Jack, which means Hogan still owes $11,999,987. Kardashian, Kim — The super-talented Kim Kardashian, seen lately romping all over the place with pal Justin Bieber, told George Lopez on Lopez Tonight that she would date Bieber “if he was of legal age.” Lopez then looked to Bieber for comment, but it was too late — the singer had already been tragically smothered and crushed between the sofa cushions beneath her. Nordegren, Elin — Tiger’s now-official ex-wife broke her silence recently, granting an interview to People magazine in which she said she’d “been through hell.” The interview allegedly went smoothly, only being interrupted once as Nordegren stood to smooth out the creases in her dress made of hundred-dollar bills. State, The — Heads up, comedy snobs. Around this time last year we were all over the moon because MTV finally released the full television run of The State on DVD (sans a few soundtrack pop songs they couldn’t get the rights to), and this time this year we have another yearly State update. PopCandy reports that on September 14, Rhino will release a rudimentary “forgotten” comedy album recorded by The State in the Bahamas in 1996, apparently when they were drinking. Rhino has a pre-order link to the album, entitled Comedy for Gracious Living, which you can access at the link below. Wood, Ronnie — The veteran Rolling Stones guitarist is set to record his seventh solo album with the help of collaborators Eddie Vetter, Flea, Kris Kristofferson, Billy Gibbons and Slash. At least that’s what all those people are telling him is going on as they show up one weekend to pack up his apartment and move him into a nursing home.